Doing what you love and making a living from your craft is the goal of many designer makers. Crafty Fox trader Luke Adam Hawker has recently done just that and taken the move into full time making with his art. We caught up with him to see how things were going and find out about his latest projects. You can meet Luke and see his creations in the flesh at our Brixton Market this Sunday, 18th September; or at our Peckham Market on Saturday 8th October. I was until recently a full time interior designer, spending the majority of the past 6 years working in the high-end residential sector. 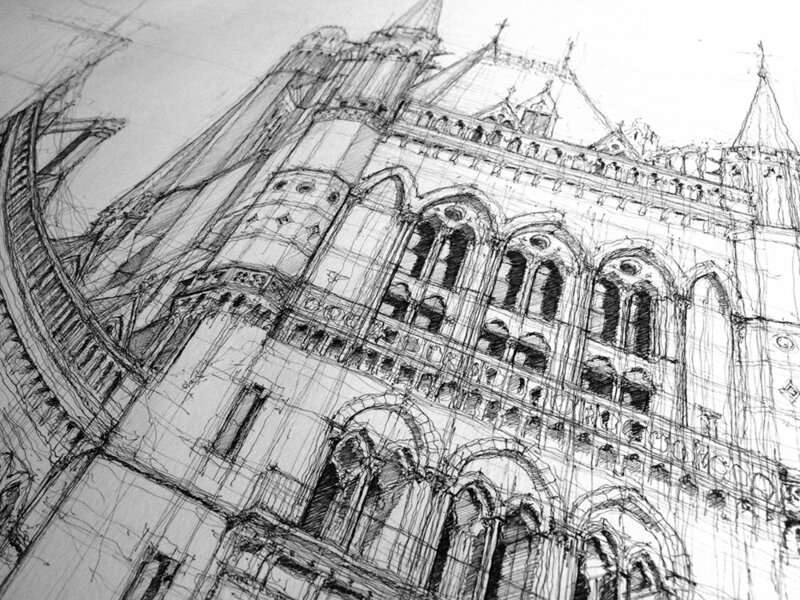 I was lucky enough to work for architectural practices that valued my drawing ability and I’ll continue to take on freelance work, as I can’t imagine leaving it all completely behind. 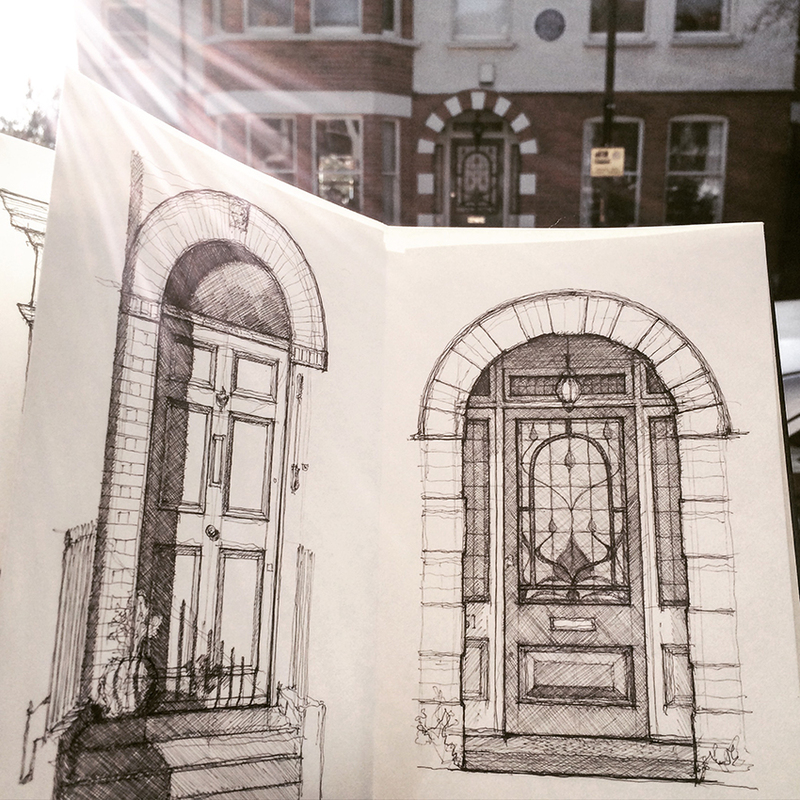 I am based in Herne Hill, but I travel all around London to draw on location, for self initiated projects and commissions. 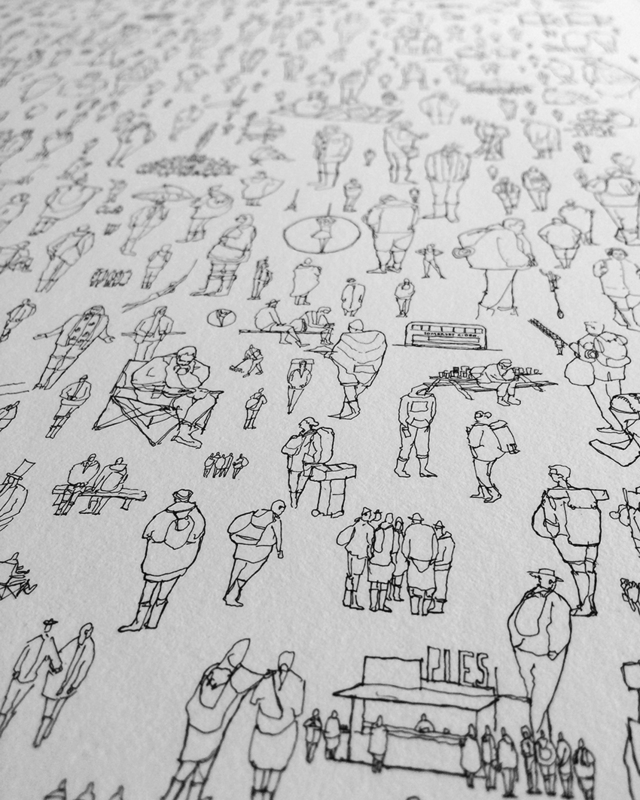 I then produce limited edition signed prints of those drawings to sell online and at markets. How long have you been making and selling your work? My first experience of selling my work was at a Crafty Fox market in Peckham two years ago. I remember that first market vividly… frames crashing down to the ground and me standing there glowing bright red, trying and failing to act as though it was all part of my master plan! Despite the breakages and embarrassment, I thoroughly enjoyed the experience and even earned enough to cover my many breakages. More importantly it kicked off the start of a steep learning curve. At what point did you think you could go full time with your art, and how did you make it a reality? Was it a scary move to take? I think the process of realisation was a gradual one; each market and exhibition built my confidence and grew my audience in an organic and natural way. Essentially the only way to make it a reality is to take the risk. For me, this was not a scary process but an exciting one. I’m fortunate to have already built a career in the creative industries. Although I have left my full time job as an interior designer, I have not left the industry - just shifted my main focus and allowed myself more time to practice my art. What are the best platforms for you to get your work out there? Nothing beats meeting people face to face, where they have the opportunity to explore my work in greater detail and I have the chance to explain my process. This is why markets are such a great platform, more so than specific art exhibitions. The environment is more relaxed and that makes interaction more natural. In terms of social media, I think all have something to offer, but as a visual platform, Instagram is hard to beat. Any advice for other designer makers thinking of making the leap? I think the best advice I could give is to try your best to make it not feel like a leap. Try to dedicate as much time as you can to your craft - if you find you are choosing to spend time on it, rather than going to the pub on Friday night….then you’re probably ready. Ironically, I think I made the decision whilst at a pub. The most common obstacle for people making the leap/jump/step is financial. I spent a lot of time working out how I could reduce outgoings and pay the rent and bills on what I knew would be a reduced income. It is essentially a decision to place value in how you spend your time over how you spend your money. Turns out time isn’t money after all, its time! We need to spend it wisely. What products will you be bringing to the upcoming Crafty Fox Autumn markets? I am very excited to be bringing my Blue Plaque Door print along to Brixton on Sunday the 18th September for its debut; this has been a year in the making with over 40hrs of drawing all around London. 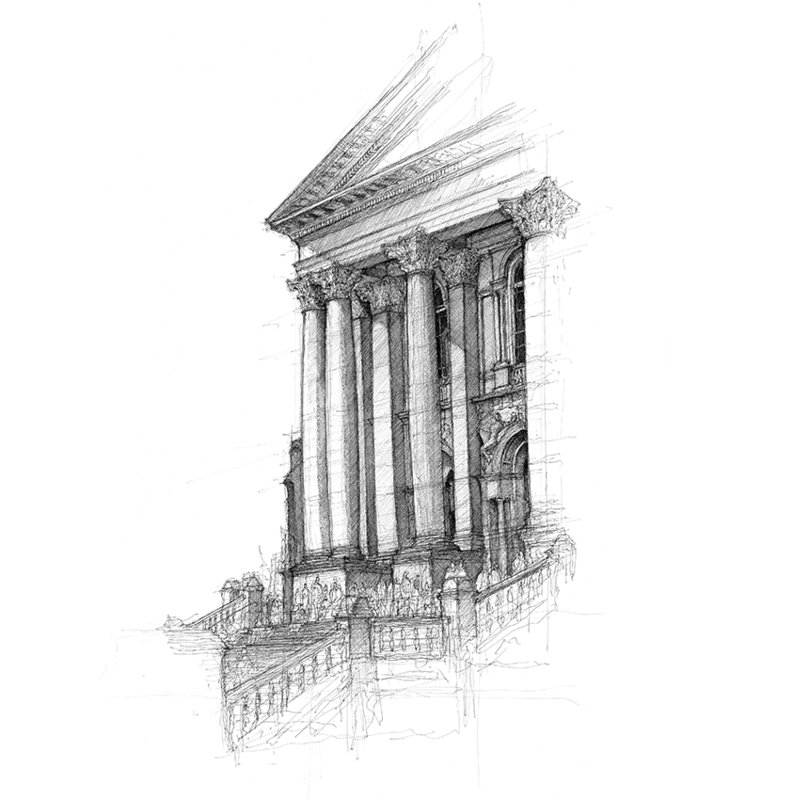 The project celebrates the amazing people and architecture of London. If you are still wondering what on earth I am talking about, take a look through my Instagram. 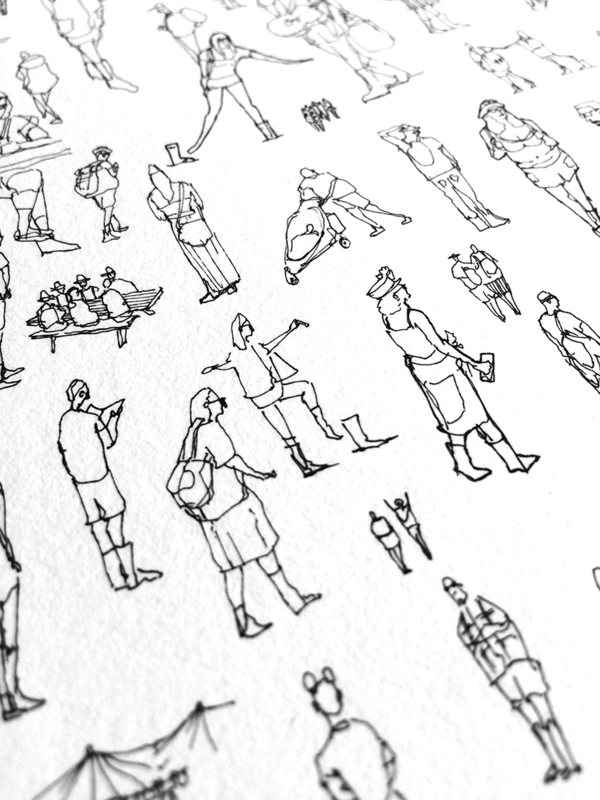 I will also have my third print in the “Peoplewatching” series with me, “Glastonbury” I had a lot of fun drawing the mayhem of the festival this year, even if most of that time was under a brolly. 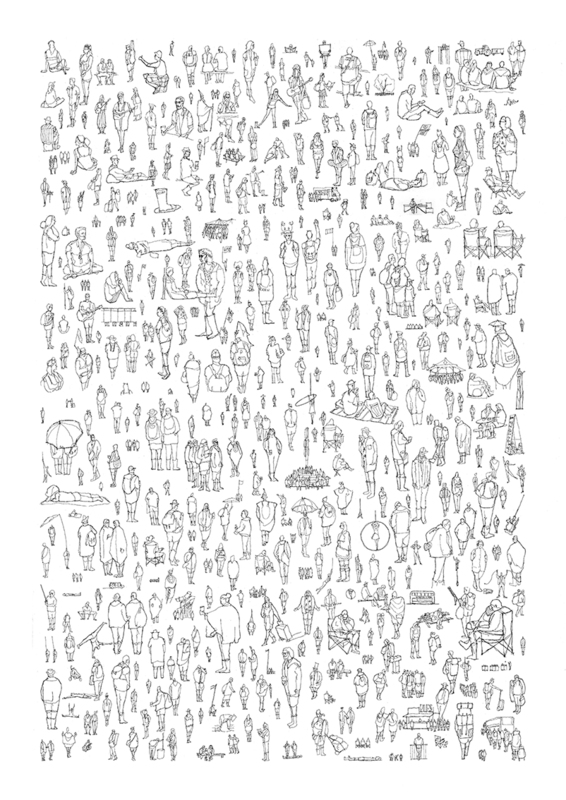 I’m hoping to meet somebody who made it into the print…you never know. A massive thanks to everyone who has supported me and my work so far, hopefully see you at a market soon. B&W portrait image by Michael Drummond. Uncovered - Market Survival Tips for the new seller!